If you’re into roughing it, there’s no reason you have to wait ’til May 24th. 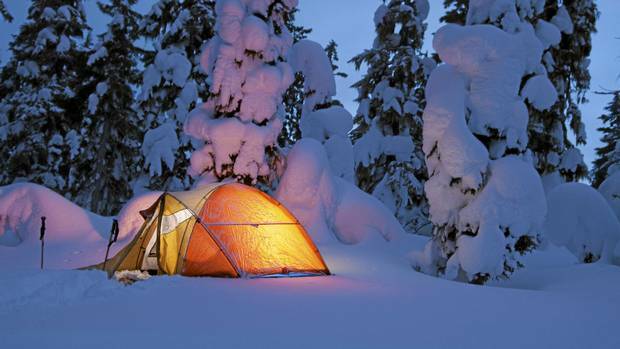 Why not give winter camping a whirl? Evergreen Brickworks is offering a PWYC Winter Camping Workshop on Family Day (Monday February 15th). The session will cover a basic introduction to camping in the cold: from packing the right necessities to making a shelter, and even how to go to the bathroom without freezing your buns off! We chatted with Winter Camping Workshop instructor Shannon Lyon, who works with Outward Bound Canada and Canadian Wildlife Federation in a partnership position designed to get more urban youth outdoors. SDTC: Why should we try winter camping? SL: We need nature. The research has proven it, but we all know that winter can be hard. But like anything, once you learn to see the beauty and fun it has, you’ll want it to last! Most people love summer so much because we spend all our time outdoors playing in the sun, so why not have those smiles last all year? Like any new activity, you can learn how to make it work for you. I can help you with that. Any tips for people that have never done it before? My first tip is to come to my fireside chat at Evergreen Family Day! Secondly, get the right gear. I am never one to believe that you need to go out and buy the most expensive gear, but there are some things you should collect up. Thirdly, prepare your food in advance as much as possible. And lastly, explore everything around you out there – it really is a different world in the winter. I hate being cold. How do I keep warm? Wear as much wool as a sheep does. Nothing beats wool. You can use your parents’ old scratchy sweaters or buy fancy new soft wool from an outdoors store. It doesn’t matter, just wear wool! And if you’re cold, dance! Once you take responsibility for your own activity and warmth, you’ll see an undeniable correlation between standing still and saying you’re cold or doing a dance and laughing that you’re warm! Clothing and movement are the biggest, but you can also put a hot water bottle in the foot of your sleeping bag before you go bed, make sure you stock up on hot foods, and there’s always the trusty hand-warmers in mittens. I’m someone who shivers from November through April, but I’m never very cold when I’m winter camping. I’ll tell you all my secrets at Evergreen Family Day! What is your background with the outdoors? I grew up in the countryside and have always been most comfortable in the woods and swamps – places where I can feel the seasons shift. I’m really into canoeing, rock and ice climbing, mountain and road biking, cross country skiing, snowshoeing, kayaking, swimming, hiking, kite skating, all kinds of camping, and anything else that can be done outside! Most memorable winter camping experience? I spent New Years Eve 2016 in the woods. Four of us hiked in with our canvas tent and little wood stove and we had a solid party with intermittent breaks for chopping wood and making yellow snow. The next morning I woke up and went for a walk alone through the woods. I came to a lake and sat still in the kind of total silence that only exists in the deep winter woods. Then I saw something moving along the ice at the far end of the lake. I sneaked around to get a better look and saw that it was a family of otters jumping in and out of little ice holes all over the lake. They were total goofballs! Winter is like that though; if you’re willing to make a little fun, the cold can’t keep you inside!